In 1973 a workshop was held at The University of Western Ontario on topics of common interest to philosophers and linguists. This volume con- tains most of the papers presented at the workshop. Also included are previously unpublished essays by R. Dougherty and H. Lasnik as well as a comment on G. Lakoff's paper by B. van Fraassen. K. Donnellan's paper was presented at the workshop and subsequently appeared in The Philosophical Review. We thank the editors of this journal for permission to publish the paper here. 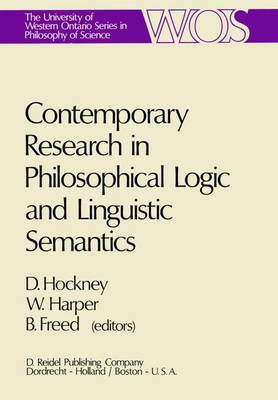 The papers by D. Lewis, R. Stalnaker, G. Lakoff, B. Partee and H. Herzberger appeared earlier in Journal of Philosophical Logic by arrangement of the editors with B. van Fraassen and D. Reidel Publishing Company. The editors thank the officers of The University of Western Ontario for making the workshop possible and Pauline Campbell for making the workshop work. THE EDITORS DAVID LEWIS COUNTERFACTUALS AND COMPARATIVE POSSIBILITY* In the last dozen years or so, our understanding of modality has been much improved by means of possible-world semantics: the project of analyzing modal language by systematically specifying the conditions under which a modal sentence is true at a possible world. I hope to do the same for counterfactual conditionals. I write A 0-C for the counter- factual conditional with antecedent A and consequent C. It may be read as 'H it were the case that A, then it would be the case that C' or some more idiomatic paraphrase thereof.